US propane production from gas-processing plants surged 15.6 percent last year to 823 million barrels, a new record. And this explosive growth looks set to continue over the next three years. 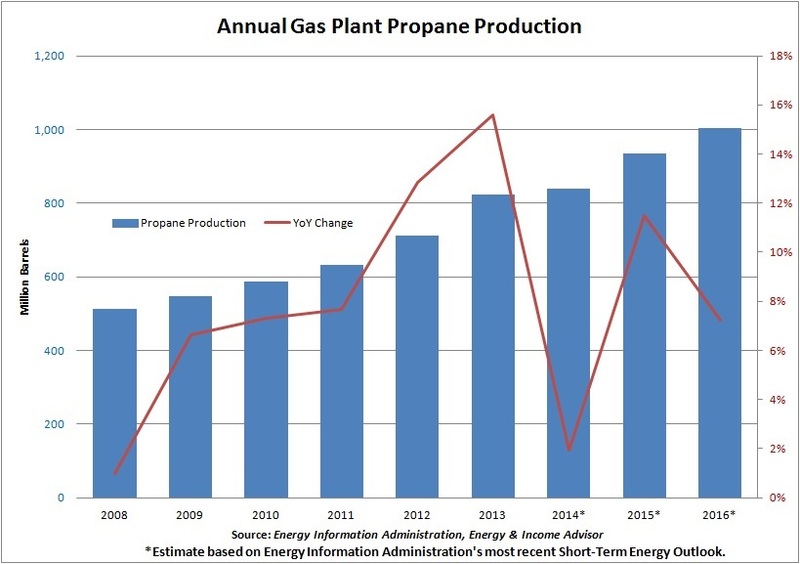 The Energy Information Administration’s most recent Short-Term Energy Outlook implies that propane output from US gas-processing plants will grow 21.8 percent over the next three years and exceed 1 billion barrels in 2016. 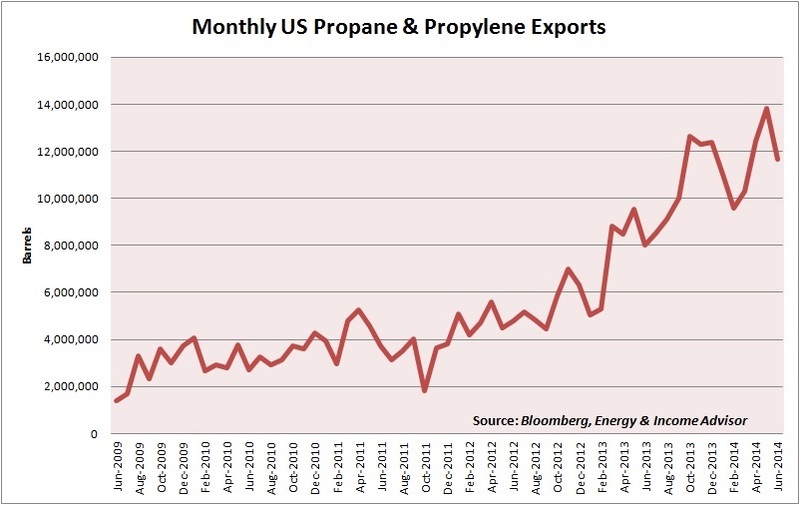 Soaring US propane production has depressed the domestic price of this commodity, widening the spread relative to international markets and prompting leading midstream operators to develop export facilities to meet robust demand for seaborne exports. Targa Resources Partners LP (NYSE: NGLS), another early entrant in this market, owns and operates the Galena Park terminal, which can load between 3.5 and 4 million barrels of liquefied petroleum gas a month. This capacity will increase to 6.5 million barrels per month after the master limited partnership (MLP) completes an expansion project in the third quarter of next year. Sunoco Logistics Partners LP (NYSE: SXL) also exports propane produced in the Marcellus Shale from its Marcus Hook terminal in eastern Pennsylvania; volumes shipped from this site should pick up later this year. 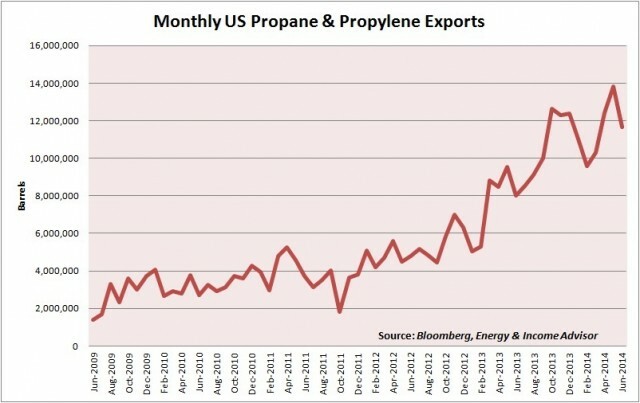 These facilities have led to a surge in US propane exports, which in the first half of 2014 jumped 52 percent from year-ago levels to 68.8 million barrels. In some months, exports have accounted for more than 23 percent of US production from refineries and gas-processing plants. As we explained in last week’s Energy in Pictures, crop drying and the frigid winter depleted Midwestern propane inventories, squeezing prices to a record high and pulling volumes north, from the Gulf Coast. Research outfit ICF International estimates that these factors boosted Midwestern propane demand by about 20.8 million barrels relative to the 2011-12 fall and winter. 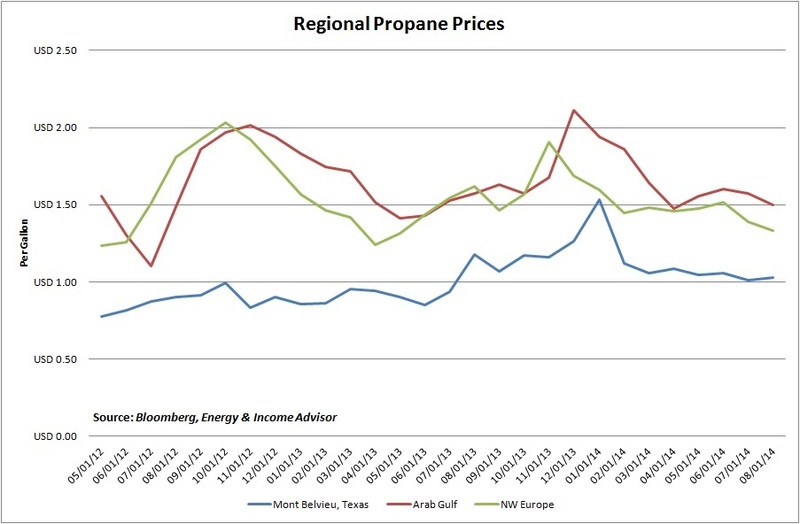 These local supply-demand dynamics pushed the price of propane in Mont Belvieu, Texas, to within spitting distance of European prices, as measured by the Amsterdam-Antwerp-Rotterdam assessment. Reports indicated that these tightening price differentials prompted overseas customers to cancel the shipment of six cargos in February 2014. A number of MLPs and other energy companies have announced plans to build additional export capacity, suggesting that international shipments will continue to climb over the next few years. 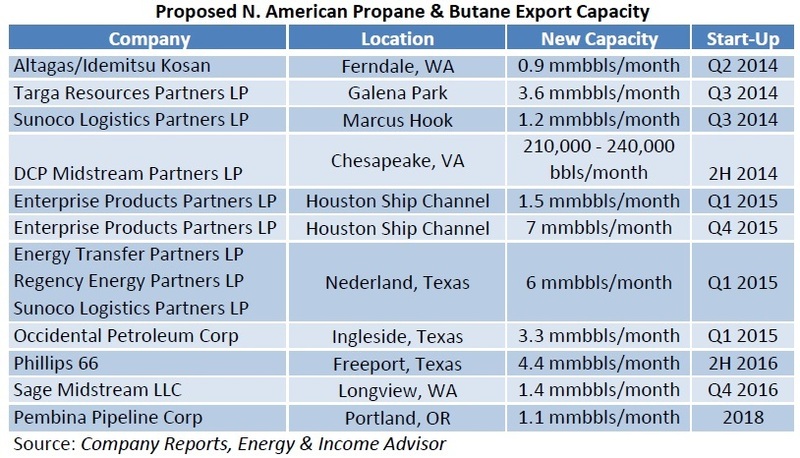 Not all these facilities will operate at their nameplate capacity, and investors should also remember that these facilities will also export cargos of butane. Meanwhile, some proposed facilities may not come to fruition. For example,Vitol and Itochu Corp (Tokyo: 8001), for example, late last year opted not to go ahead with a planned export facility in Beaumont, Texas. Likewise, Williams Companies (NYSE: WMB) and Boardwalk Pipeline Partners LP (NYSE: BWP) suspended investment in their proposed Moss Lake project. As growing US export capacity links domestic propane prices to international markets, the economics of overseas shipments could become more volatile, especially in the winter months–a concern for companies that have exposure to export margins. In the meantime, out-of-favor European petrochemical names stand to benefit from access to relatively inexpensive US propane. And over the next few years, the widening of the Panama Canal and a huge expansion to China’s propane dehydrogenation capacity should boost demand for US propane exports in Asia.